WASHINGTON, Aug 15 2013 (IPS) - Against the backdrop of two major announcements of Israeli settlement expansion, U.S.-brokered peace talks between the Israelis and the Palestinians resumed Thursday in Jerusalem. The talks are the result of an intense effort by U.S. Secretary of State John Kerry to overcome the impasse that has kept talks frozen for nearly three years. After preliminary meetings in Washington two weeks ago, the parties commenced what is expected to be a nine-month process of talks. But on Sunday, Israel announced that it was moving forward with plans to build nearly 1,200 new housing units in East Jerusalem and the West Bank. Many observers believe the timing was meant to forestall heavy opposition to peace talks from within Israeli Prime Minister Benjamin Netanyahu’s governing coalition. Israeli Housing Minister Uri Ariel, a leading pro-settlement hawk, made the view of his faction very clear. But the timing was aggravating to the Palestinians, who are taking a major political risk by engaging again in peace talks without an explicit Israeli promise to stop settlement construction. This was the sticking point for the Palestinians when they discontinued talks with the Israeli government three years ago, as Palestinian anger at many years of talks while settlements expanded and multiplied neared a boiling point. Daniel Levy, director of the Middle East and North Africa Programme at the European Council on Foreign Relations, says that the problem is the massive imbalance of power between them and Israel. “It is the Palestinian leadership’s participation in talks under these conditions that would appear to make the least sense, as evidenced by them now having to digest Israel’s new settlement announcements,” he wrote in an op-ed for Al Jazeera. Palestinian embarrassment was magnified even more on Monday when Israel announced another 890 units would be built in the settlement of Gilo in East Jerusalem. 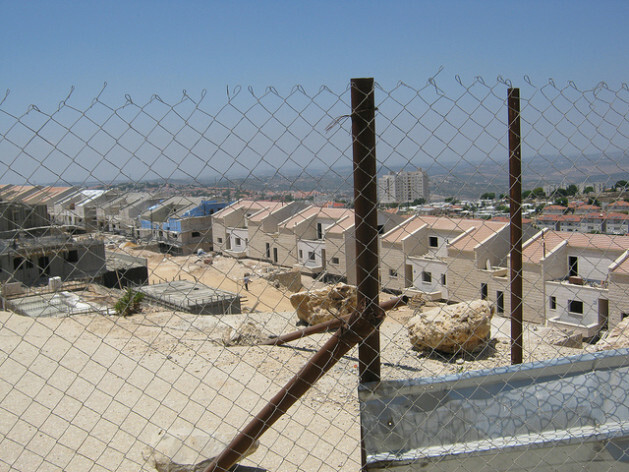 Gilo is a particularly sensitive settlement, as Palestinians contend its ongoing expansion is strangling the adjacent Palestinian city of Beit Jala. Israel considers it an integral part of Israeli Jerusalem, despite the fact that it lies beyond the 1967 border. Yet Shtayyeh and the rest of the Palestinian negotiating team reported to the talks on Tuesday as scheduled. Kerry seems determined to keep talks going, and certainly gives the impression of matching that determination with a belief that he can succeed despite difficult conditions and the recent obstacles. While he primarily endeavored to prevent the settlement expansion from derailing the talks, he also, according to reports, communicated the same message to Netanyahu that he gave publicly in Colombia. Kerry’s efforts have raised hopes among the backers of a two-state solution to the conflict. Jessica Rosenblum, spokeswoman for the “pro-Israel, pro-Peace” U.S. lobbying group J Street, told IPS that, “The serious and sustained engagement of the administration in achieving a two-state resolution early enough in President Obama’s second term when they still have the time and influence to get it done is a potential game changer. “What strikes me most about Secretary Kerry’s response is his zealous desire to safeguard the negotiations themselves and give them the space they need to take root and ultimately bear fruit,” Rosenblum added. Israel released 26 long-term Palestinian prisoners ahead of the talks on Tuesday. The move was highly controversial in Israel, but the Palestinians needed a dramatic gesture to legitimise their participation in talks and this was seen as easier than a settlement freeze. That decision, which engendered passionate protests by Israeli citizens, shows just how concerned Netanyahu is about the power of the settlers. Even J Street acknowledges how formidable this obstacle can be, though even there, Rosenblum sees some hope. “Netanyahu has got a serious problem with the settler movement that will only grow worse as the negotiations progress,” she said. The current wave of settlement expansion reflects a “map of national priorities,” which Israel released on Aug. 4. That map included funding for many settlements, including some outside the major settlement blocs. So, despite the very real hope that Kerry’s efforts have engendered in some quarters, observers like former advisor to Ariel Sharon, Dov Weisglass, are more cynical. “Economic benefits to isolated settlements scattered deep within the Palestinian territories undermine the possibility of an agreement and make a mockery of the Israeli government’s peace rhetoric,” Weisglass wrote in an op-ed in a leading Israeli daily. That view seems to be well in the majority, on all sides.